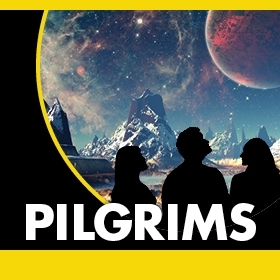 Tonight we'll be ChiILin' in Chicago's Jefferson Park neighborhood on the north west side for the press opening of Pilgrims at The Gift Theatre. We adore this tiny store front theatre that's big on award winning productions. They make the most of their space with clever, multilevel staging, and the intimate audience size keeps things personal and fosters strong connections between players and patrons. We can't wait to catch this futuristic drama. The Gift Theatre is at 4802 N. Milwaukee Avenue. On a spacecraft on its way to colonize a newly discovered planet, a soldier and a teenage girl live together in one of the ship’s cabins with only an outdated robot and each other for company. When they are quarantined in their close quarters due to a potential outbreak, they’re forced to explore their own traumatic pasts in a dying society.